It could be argued that the most significant advances in the past two centuries have been made in the fields of science and technology, and that the defining objects of our culture are its mechanical devices. 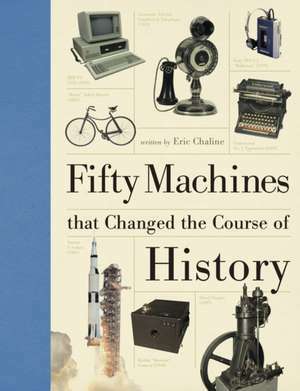 Rather than at looking at technology as a succession of generic inventions, 50 Machines that Changed the course of History identifies the most significant branded or one-off machines of the nineteenth and twentieth centuries, placing them in their historical and technological contexts, and evaluating their impact on the development of human civilization. The preeminent machines of the First Industrial Revolution, the "Age of Steam," include the first locomotive designed for passenger transport, Stephenson's Rocket (1829), and the Corliss steam engine (1849) that powered Britain's "Satanic mills," in which the Harrison power loom (1851) produced the bulk of the world's cotton cloth.